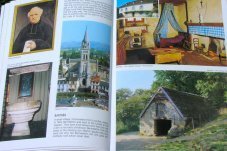 Lourdes book - 'Hope and Sharing' - the history of Lourdes and Bernadette. Discover the story of the life of Bernadette and of the main religious and historic sites of Lourdes through the many illustrations in this wonderful book. The book also includes a detailed map of the Lourdes Sanctuary. This 79 page book on Lourdes that can be easily carried about and consulted with joy and pleasure wherever you are.